Exeter now have 75 points and are comfortable at the top of the table while London Irish move close to the relegation following their 17th defeat from 20 games this season. Even though Ben Moon scored the opening try for Exeter in the third minute, the lead tripled for the visitors with Simmonds crossing over twice in the 20th and 31st minutes. Gareth Steenson converted all three tries as the first half ended with a 0-21 lead for Exeter. Simmonds got his third after the break that has taken him to just one behind Worcester Warriors' Josh Adams, who is the tournament's leading try-scorer this season. Steenson kicked a penalty and a conversion on either side as Exeter scored 31 unanswered points. Winger Joe Cokanasiga's touchdown in the 56th minute was the only points in the game for London Irish but Exeter went on to add two more tries coming from lock Mitch Lees and replacement Jack Yeandle in the 61st and 77th minute that was improved by Steenson on both the occasions to complete a 5-45 victory for Rob Baxter's men. 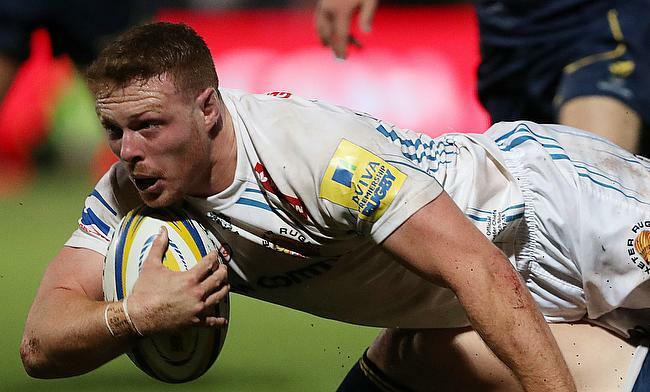 The win has put Exeter eight points clear of second placed Saracens while London Irish are trailing Worcester Warriors by nine points in the battle for relegation.